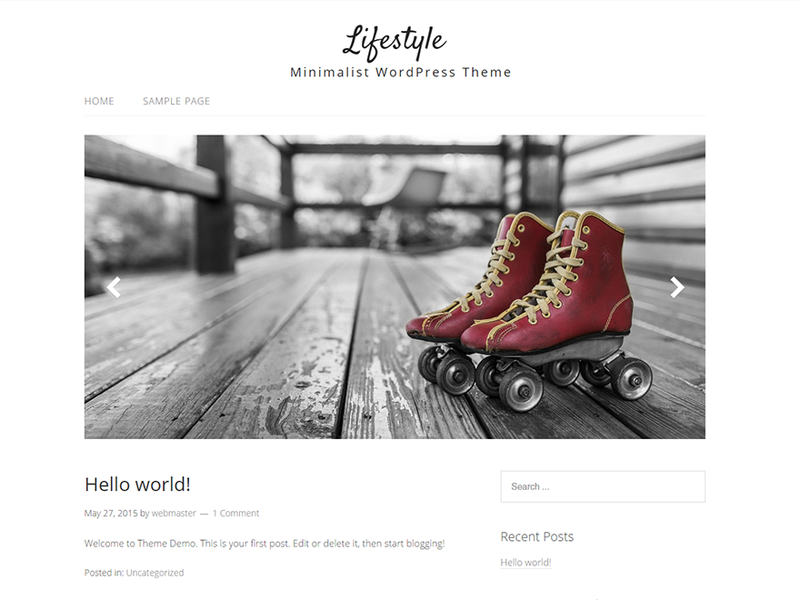 Lifestyle theme is a minimalist responsive HTML5 Omega child theme for WordPress, created with simplicity in mind. This entry was posted in Uncategorized on August 11, 2015 by themehit. Hello, I am using the Lifestyle theme and really like the options and lay out, but cannot get the header image to work. Any help would be greatly appreciated. I just updated Omega, and now my entire site based on Lifestyle Shows php Errors! Please help. I took the site offline, People should not see it that way. (and other lines). Anything I have done wrong? Hi Holger, you did nothing wrong. Please update your omega parent theme. It will fix the issue. I really love the simplicity of this theme! However, this theme advertises that it can have a full width page. I have not been able to change this theme to remove the sidebars. I am having this issue as well. 1. Log in to the WordPress admin. 2. Click the Appearance panel, then Themes. Hi, I would love to center my menu. Any advice? How do I remove the navigation bar from the mobile site…I have removed the menu in custom css but want no navigation on the mobile site also? Regarding the sample header (the roller skate header). What are the dimensions of the header? Today I posted something on my site, and suddenly there was this huge featured image on top of the article. This is the first time I saw it, but want it to be removed again. How can i do this? we love your simple theme – thank you very much. We are having a problem where we are posting photos in a post but only the text is showing up on the live site. Are we doing something wrong? Can you send your page url so we can take a look? thank you very much for your theme! I would like to change only one css-style: I would like a bold active menu-item. Thank you very much for an idea! Is it possible to have different language versions on this theme and in this case how to I do that? Currently my website is in swedish, but I would like to have an english version too with english logo, menue etc . I’ve just installed Lifestyle on a client’s site only to discover that it is a child theme of Omega. Will I need to install Omega or will Lifestyle work as a stand-alone theme? If I do need to load Omega, will I need to re-do the content that Ive already loaded into Lifestyle? Never mind…just realized that Omega was already installed. How do I find out what font is used in this theme? I notice my site title is a different color when I click on individual posts; how to I make it the same color throughout the site? Thanks! I like this theme but and having a hard time figuring out how to make the static pages into category pages. Can you help me out? thanks! You can create menu item from category, go to “Appearance > Menus”, and select a category from Categories tab. What are the optimal dimensions for a logo image to use with Lifestyle? Is it possible to use a logo image and the text title/subtitle? Thank you very much for your work on this theme! There is no standard for optimal dimensions for a logo, just make sure it proportional. By default, you can only use Logo image with Tagline as text. Or you can insert your text into your logo image. In that row, where you have the text “Minimalist WordPress Theme” I would like to use my address and mobile number. However , rather having them together in one row and centred. I would prefer to make them apart and have an address on left handside and mobile number on the right. Is there a way how to do it? Perhaps a code or something? As I was unable to separate them, given the available scope of adjustment. That’s not possible because tagline field cannot accept HTML tag, you need to customize the theme or insert your address and phone number into the logo. Hi, I chose left sidebar as a template for one page and while there is no space for a left sidebar I do not understand where I can put the content in for the left sidebar / create the left sidebar. Both, your help and your theme is very much appreciated. thanks! Can you post your page url? Left sidebar template page should work with sidebar on the left and content on the right. I love your design. I just have one question. When I visit the site the feature image is there, but when I click on the post and visit the actual link the feature image isn’t there. Is there a way to keep the feature image? Glad you like it. You can insert the featured image into Post content body (editor) and use post excerpts (Go to “Appearance > Customize > Post > Display post excerpts”) on blog page to prevent double images. How would I go about changing the body/article text from grey to black? Hi there, absolutely love this theme .. perfect for our site. One little thing though is that I don’t seem to be able to get checkboxes to show up on forms … can you help? Seem to be that radio elements are doing the same thing. Hi Alan, thanks for your feedback. This issue has been fixed. Please upgrade your lifestyle theme. Hello, I’ve been using the Lifestyle theme for a while and I love it, but only now I realized that my Google analytics isn’t working. I was going to put the tracking code again, but I can’t find the tag . I was also going to put a Pinterest pin button on my pictures, but for that I also need the tag . Hi Carolina, I don’t think it’s because of the lifestyle theme. I’d suggest use Google Analytics plugin for WordPress. You can also search Pinterest plugin in WordPress plugin repo. Rather that show a summary of a post with a link to [read more] to see the whole post I would like to show the entire post each time. Is that possible? I am so sorry for bringing such a silly question; I thought it was a CSS thing. Thanks for the prompt response, I appreciate it! I’d love to hide the menu completely. I deleted all menus but a little black dot still appears in its place. Is there any way to completely hide it? When I thought I had made all the teaks needed, I noticed the post are showing in alphabetical order and not chronological which I thought was the wp default. Any idea why and how I can change it? Your post “A bolacha diferida” is sticky to the home page. You can change the visibility status of that post and they will be chronological. Got it. Thanks a lot. I didn´t think to look there. Hi, I like your Lifestyle theme very much. How can I customize the default Home page to display only the latest posts 2-7? Latest post 1 is displayed in the slider. There appears to be writing on the top left of my home page and I’m not sure where it came from- is there a way to get rid of this? Hi, i would like center my blog page please how can i do it? The requested URL /the-shop/ was not found on this server. Hi Jessie, you have to setup your WordPress permalinks. Btw, this issue is not related to lifestyle theme. I love this beautiful theme! My question: On the blog posts, is there a way to hide the author of each blog post from public view? Hello. Thanks for the great template. I have a couple, seemingly simple, questions. First, how can I make a “Home” page that is not really a page, but simply a link to the main domain? In other words, it would take you to mydomain.com instead of mydomain.com/home/? Second, is there a way to only have the header show up on the home/mail page? I’d like the posts for instance to take you to a simpler page without the header images. Ah, I guess I figured out the first question. I created a menu called Home, and that worked. So Home is a menu, but the others are pages. That did the trick. Question #2 still stands 🙂 Thanks! And one more question! How do you determine where your POST go? In other words, I’d like the page called “Blog” to have all posts, but at the moment can’t figure out how. Thanks again. I have centred my main menu but I would like to left align the sub-page menu items. Is there a simple way to do this? center align the UL element only, so the li will be left aligned by default. I love your simple theme – thank you very much for your work- I would like to align my menu bar- the social icons are floating above the line- any way of fixing this? Is it possible to change the font size for the tagline? Thank you! That really helped! Another thing, I’ve been trying to remove the default navigation bar on the mobile theme with no success… what else can I try? Hi! It is a wonderful theme indeed. I love using it. Just need help with one thing. The image added to the blog post does not show up with the post excerpt even after selecting ‘show featured image’. Am I doing something wrong here? Hi Shivani, go to “Appearance > Customize > Post” and choose “Display Full post”. Select “Display post excerpts” will limit the text and strip all formatting and images. I love this simple theme! Is there a way to hide the category name at the top of the page? For example, on my website http://www.nicolet.life when you click “.life” in the menu, the category title “life” displays on the top of the page. I don’t want this title to appear.